Designers in wildfire country used heat-resistant corrugated concrete board to construct the walls of this fire-safe SoCal home. Folding doors made of perforated metal panels won’t ignite as easliy as wooden shutters if wildfire embers are blowing in the wind. Huge folding doors made of perforated metal panels keep the bedroom areas private but cool; they let breezes through, but won’t be ignited by wind-carried embers. 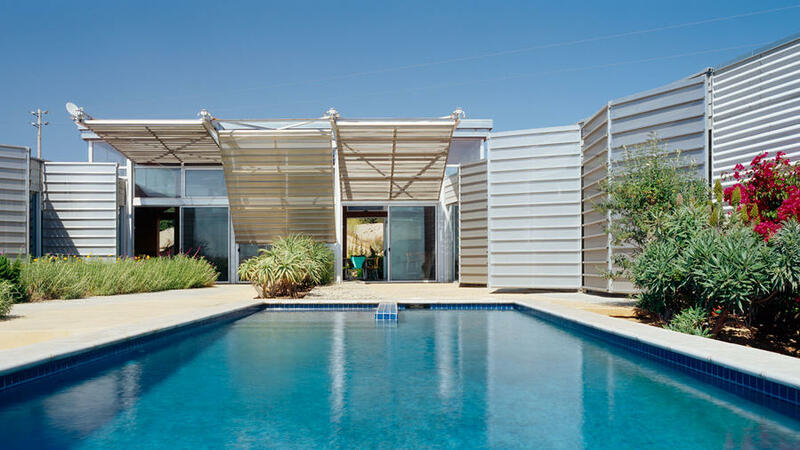 Bonus: Similar panels serve as awnings—they tilt up, like garage doors—for the living room’s glass walls. A gasoline-powered fire hose lets firefighters make use of the 21,000 gallons of water that this pool holds in case the house is in harms way. A gasoline-powered fire hose (off the grid, it works even when electricity is lost) lets firefighters make use of the 21,000 gallons of water that the pool holds. (That’s about the amount needed to save a 2,000-square-foot home.) If you don’t have a swimming pool, you could install a cistern or rain barrels. Instead of the usual gypsum or wood-composite wall­board, the designers specified corrugated concrete board, which is often used in kilns; it’s both noncombustible and heat-resistant. Bonus: Besides protecting the house from fire, it limits heat gain during hot summer months. When constructing a fire-safe home, you don’t have to forfeit signature style. These glass walls are made of laminated glass, which is much stronger than double-paned. The home’s signature glass walls are made of laminated glass, which is much stronger and more fire-resistant than even double-paned. It’s also more expensive, though. If you can’t afford to replace all the glass in your house, use it on the windward side, which is most likely to face oncoming flames.